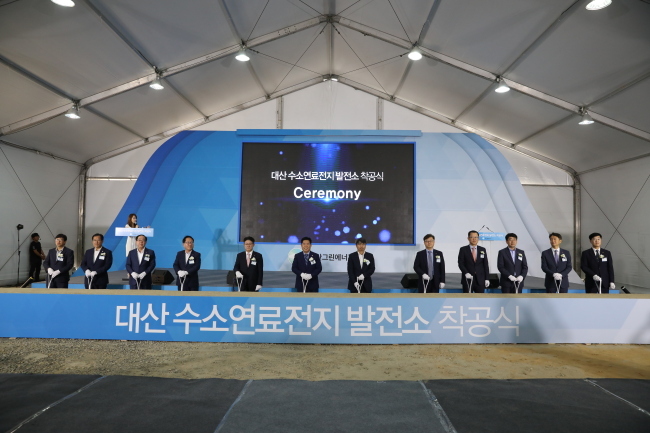 Hanwha Energy, the energy arm of South Korean conglomerate Hanwha Group, broke ground Thursday to build a 50-megawatt hydrogen fuel cell plant in Seosan, South Chungcheong Province. The plant is the first in the world to use byproduct hydrogen as fuel, officials said. The plant is to start commercial production from June, 2020 and is set to provide 40,000 megawatt-hours of electricity. To build the plant, Hanwha Energy has established a special purpose corporation named Daesan Green Energy in a joint venture with Korea East-West Power, Doosan and SK Securities. Hanwha Energy holds 49 percent stake in the venture of 255 billion won ($225.8 million).